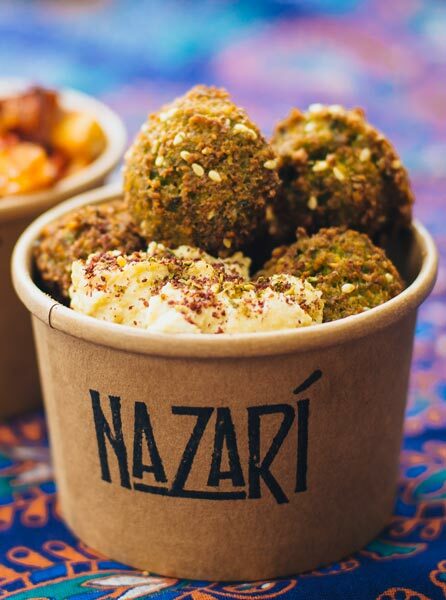 incorporating the best of Mediterranean and Middle Eastern food tradition. Our side project is our olive and almond grove in Granada, Andalucia. to the streets of London! We cater all kinds of private and corporate events. Get in touch and we´ll be happy to discuss your event with you. We produce our extra virgin, certified organic olive oil in collaboration with a small olive press cooperative of local farmers in Granada. on locally sourced, naturally and ethically farmed produce. Our side project is our olive and almond grove in our second home; Granada, Andalucia. 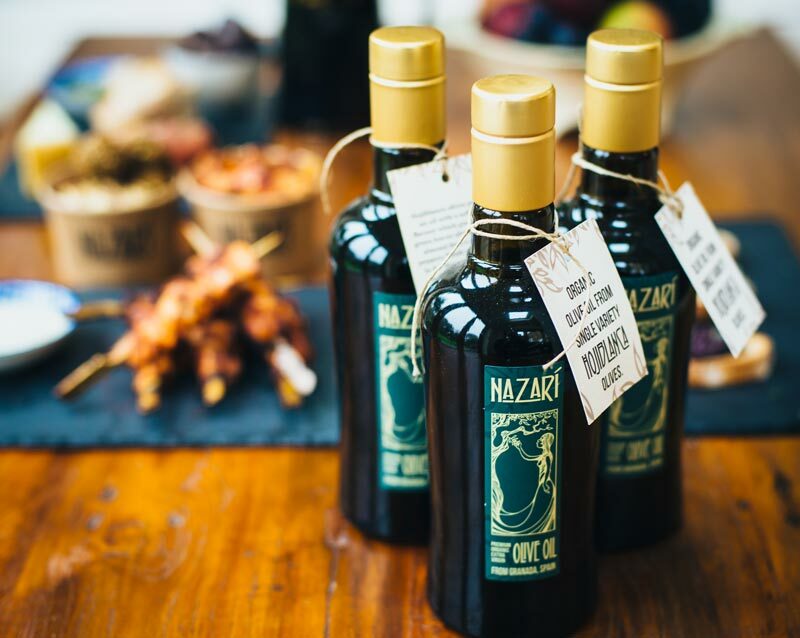 In 2016 we launched our premium quality, organic, single variety olive oil. 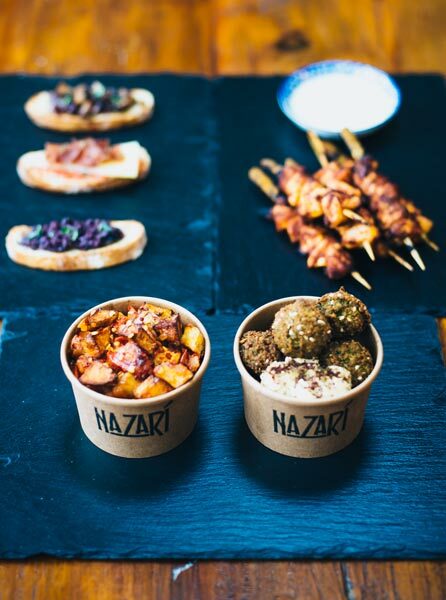 including our Moorish Tapas options which are perfect for parties. 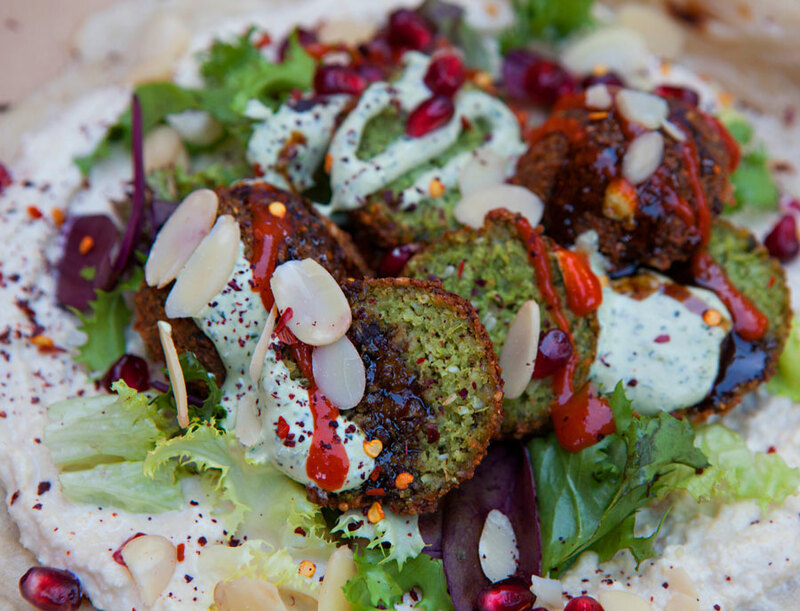 Aswell as the flat bread wraps show below, we also offer gluten free and vegan Falafel Salad boxes and Falafel and Haloumi salad boxes. Menu items can be adapted for special dietary needs and you can choose which garnishes and sauces go on each wrap according to your preference. Just let us know! Please contact us for special events menus including our Moorish Tapas options. 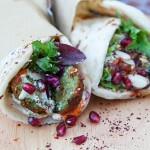 Our famous Falafel is made predominantly using British grown organic fava beans. Served with hummus, baby leaves, lightly dressed cabbage slaw, pomegranate molasses, yoghurt mint garlic tahini and chilli sauce with a scattering of pomegranate seeds. The shredded roast chicken is cooked in its own garlic and parsley infused gravy with Moorish spices to give maximum flavour. Served with green salad, lightly dressed cabbage slaw, pomegranate molasses, pomegranate seeds, peppers and a choice of our own tahini sauce and chilli sauce. 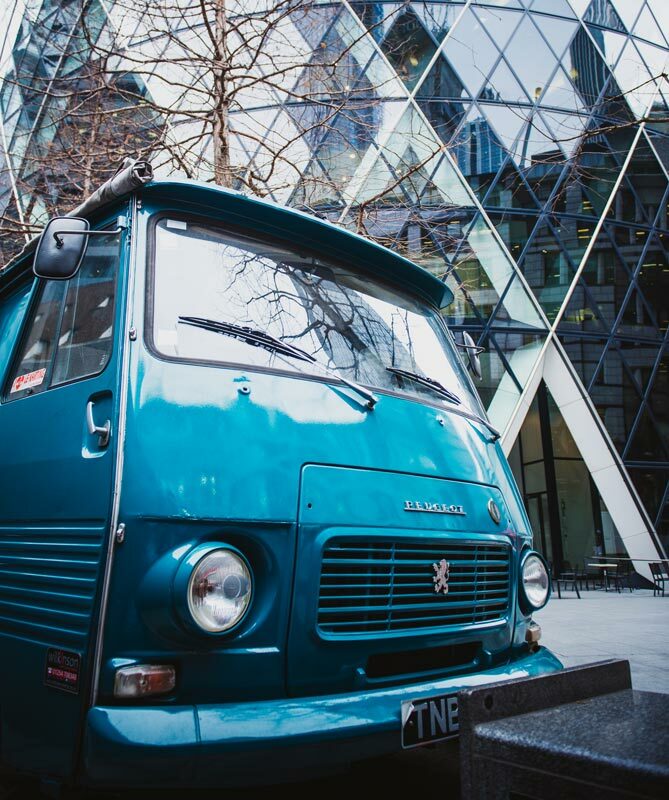 With our vintage foodtruck we cater for all kinds of private events. We can provide wedding catering, corporate events and private party catering. Our streetfood flatbread wrap menu is very popular for events but we also have the Moorish Tapas menu which is great for canapé services. Get in touch using the contact form below and we´ll be happy to send you a quote! of our 1974 Peugeot J7 van. 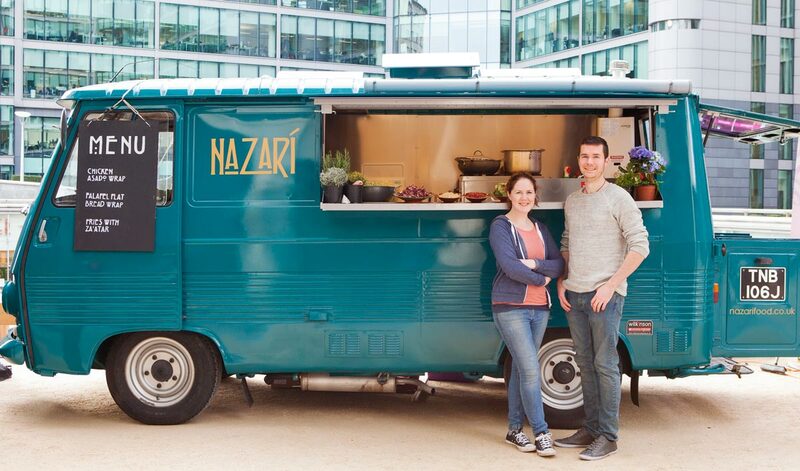 to events and we think the van looks amazing too! Our olive and almond grove is located in the south of Spain in Granada, Andalucia. The land also has a few fig trees so in late summer we always have plenty of delicious sun dried figs! We maintain the grove using exclusively traditional methods. No chemicals or pesticides are used at any stage and the harvest is done by hand without the use of any machinery. The grove is located to the North of Granada capital between the villages of Guevejar and Alfacar and has wonderful views of the Sierra Nevada. 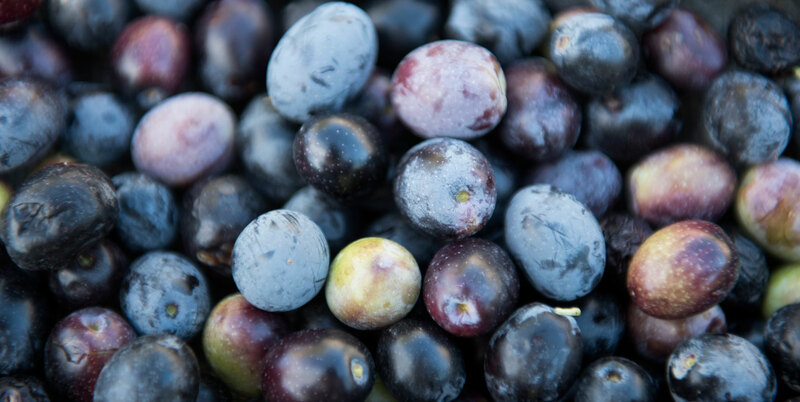 We produce our extra virgin, organic, single variety Hojiblanca olive oil in collaboration with a small olive press cooperative of local farmers, Cooperativa San Sebastian, in the village of Alfacar. Please, answer the following question to prove you are not a robot. 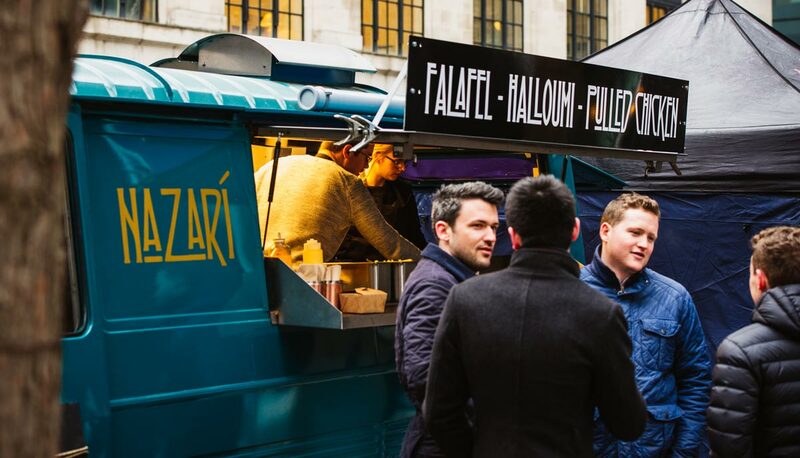 As well as our J7 classic catering vehicle, we also have our own gazebo set up for private events so we are able to cater for all kinds of private or corporate events. Just get in touch with details and we can suggest menu and service options.